Zion Lutheran Church, located in south Fort Myers, Florida, is pleased to welcome Reverend Doctor Curtis L. Deterding as Senior Pastor to their church and community. Pastors from Lutheran churches throughout the district, including Senior Pastor John Zehnder of Saint Michaels Lutheran Church, will take part in services and an installation ceremony held at Zion Lutheran Church on Sunday August 17th at 3:00PM. The community is invited to attend. “I am very much looking forward to this next chapter in my life, as the Lord leads me to work together with the redeemed people of God at Zion Lutheran Church, serving and glorifying Him in all we say and do,” says Pastor Deterding. Pastor Deterding was born in Kansas City, Missouri, where he spent most of his life and his father served as a Pastor. He met his wife and best friend of 32 years, Jo Ann, while enrolled at Concordia College, St. Paul, Minnesota. He later completed his Doctor of Ministry degree from Concordia Seminary in St. Louis. He and his wife have five children. Faith, who is their youngest, will be a sophomore at Cypress Lake High School in the fall. “There were many strong candidates considered for Senior Pastor at Zion Church, and our congregation was unanimous in its selection and issuance of the Call to Reverend Doctor Curtis L. Deterding,” says Gerry Poppe of Zion Lutheran Church. “His grounded faith, extensive education, hands-on experience, and warm and outgoing communication skills all make him the ideal candidate to lead our church,” adds Poppe. 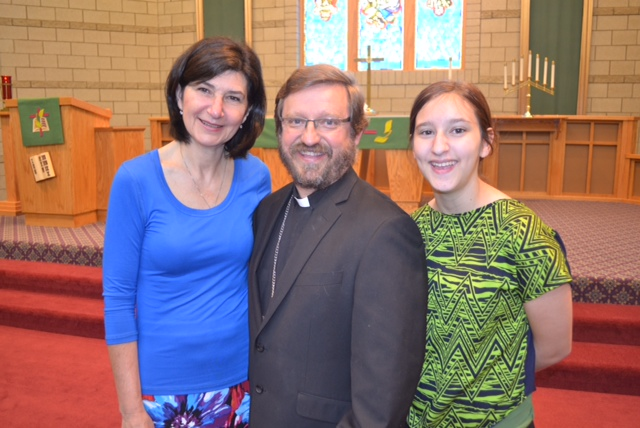 Pastor Detering and his wife previously lived in Florida where they both served as Lutheran School Teachers at Holy Cross Lutheran School in North Miami, Florida. A few years later, he enrolled at Concordia Seminary in St. Louis, and then went on to serve at Emanuel Lutheran Church in Lancaster, Ohio; Assistant Pastor of Youth and Family Ministry at Bethel Lutheran Church in Claremont, North Carolina; Coordinator of a special church careers program called Project Samuel at Lutheran Church Missouri Synod on the campus of Concordia University, St. Paul, MN; Pastor of Faith Lutheran Church and School; and Administrative Pastor of Trinity Lutheran Church and School in Fergus Falls, MN. Over the years, Pastor Deterding has served the community in many ways. He is a speaker, writer and co-author of a book called Considering a Church Career. He was a soccer coach and referee and served on numerous boards and advisory rolls.